Looks like fans aren’t done with the Tanner-Fuller fam yet. Netflix has renewed the Fuller House TV show for a fifth and final season. The subscription streaming service broke the renewal news in a video announcement today, and they promise they have saved the best for last. Check it out, below. 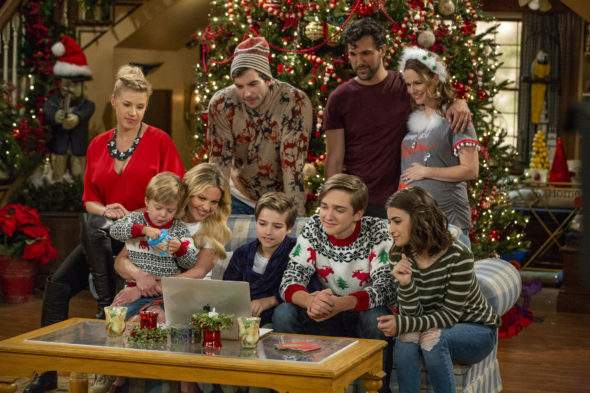 A Netflix sitcom, Fuller House stars Candace Cameron Bure, Jodie Sweetin, Andrea Barber, Michael Campion, Elias Harger, Soni Nicole Bringas, John Brotherton, Ashley Liao, Juan Pablo di Pace, Scott Weinger, Adam Hagenbuch, Dashiell Messitt, and Fox Messitt. John Stamos, Dave Coulier, Bob Saget, and Lori Loughlin recur. Last week, we reported a fifth season was coming, and now Netflix has confirmed it. A sequel to Full House, which ran for eight seasons and 192 episodes on ABC, this family sitcom centers on widowed mother and veterinarian, D.J. Tanner-Fuller (Cameron Bure) and her three sons; her sister Stephanie Tanner (Sweetin); friend Kimmy Gibbler (Barber) and her daughter. The final season of Fuller House should drop to Netflix in the fall of 2019. What do you think? Are you a fan of the Fuller House TV series? Is it ending at the right time or not? If it were up to you, would Fuller House be cancelled or renewed for season six on Netflix? More about: Fuller House, Fuller House: canceled or renewed?, Fuller House: ratings, Netflix TV shows: canceled or renewed? Fuller House: Has the Netflix TV Show Been Cancelled or Renewed for Season Five? Please don’t cancel this show! This is one of the few shows on Netflix that I really enjoy. Hope they rethink this decision I love it takes be back to my childhood and my girls remind me of how much I loved full house because they love this show as well! Please don’t cancel! This one of my favorite shows! It’s a fantastic continuation of Full House. Okay then. How about we cancel our Netflix after season 5 is out. I am sure Netflix will love that. Wtf Netflix?! Why cancel something that people like? Is it because they’re too busy making movies with stupid endings? Dont cancel! I love this show. One of my favorite shows on NF right now. Im so sad. Fuller house does not need to be cancelled. It’s one of the only normal shows around. The only reason why I purchased netflix was for this show. Well, it looks like that without creator Jeff Franklin, it feels like nothing! You know it has a new creater well maybe new producer but still HENCE BRYAN BEHAR AND STEVEN BALDIKOSKI are the NEW SHOW RUNNERS!!!! This is really stupid!!!!!!!!!!!!!!! The show should NOT be ending after JST 5 seasons it needs 8 seasons atleast!!!! Plz continue the show Kim and Fernando get married or remarried and Stephanie and jimmy get married and finally name their baby girl! And Matt and D.J. get married!!!!!!!!!!!! Agree on everything except Matt and DJ getting married. I WAS Team Matt, but now after the whole blowup @ Steve and CJ’s wedding, I’m Team Steve all the way.